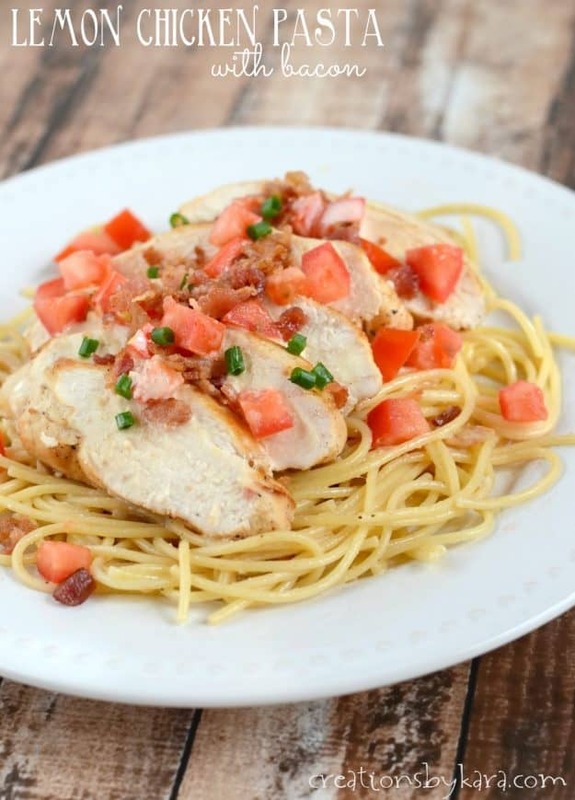 With a light lemon sauce and a sprinkling of bacon, this Lemon Chicken and Pasta is sure to be a hit! I adapted the recipe from Your Homebased Mom. The first time I made it, I followed her recipe exactly. The lemon flavor was a little overpowering for my family. After two more tries, I finally came up with a version of the recipe that my family loved. If you like lots of lemon feel free to add more lemon juice and zest to yours. This recipe calls for grilling the chicken, but we’ve only done that once. The other two times my husband wasn’t around, so I cooked the chicken in a skillet. Because to be perfectly honest, I do not grill. Two reasons. 1- Our auto lighter is busted and you have to light the grill with a match. I’m afraid I’ll blow my hand off. Or singe off my eyebrows. 2- I cook 95% of the meals that are served at our house. My husband does the grilling. Secretly I’m afraid that if I start grilling, I’ll end up doing it all the time. And let’s face it–even though I like to cook, sometimes it’s nice when someone else does it. I don’t wanna go messing with our arrangement. 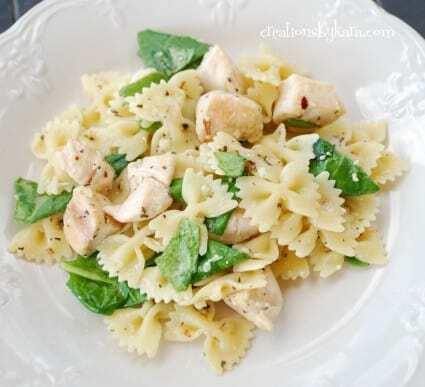 Cook your pasta in salted boiling water while you prepare the chicken. Drain, but reserve 1/4 cup of the pasta water. Sprinkle salt, pepper, and rosemary on both sides of each chicken breast. Grill or cook in a skillet with a small amount of oil for 7-8 minutes on the first side. Zest and juice the lemon. Combine one tablespoon of the lemon juice with the honey. 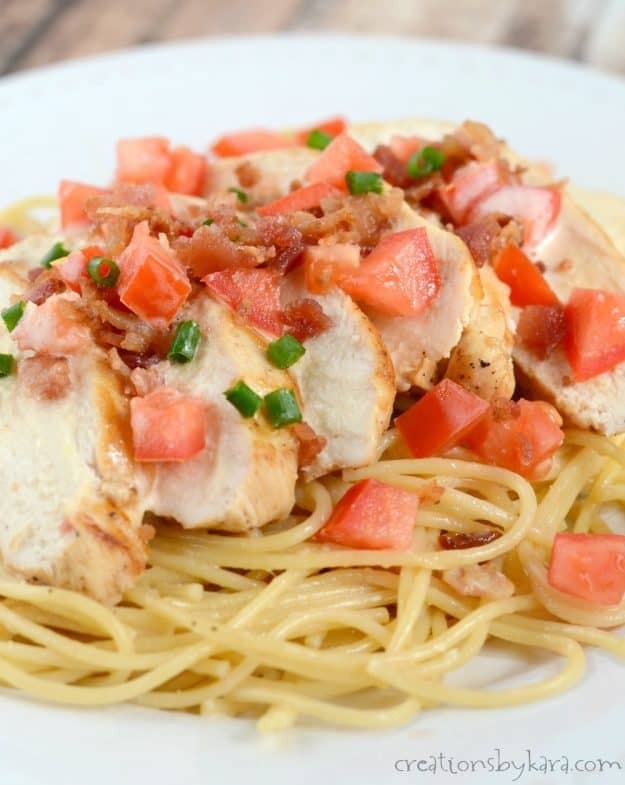 Brush over the chicken breasts, flip, and brush on the remaining sauce. Cook till chicken juices run clear. Set aside chicken and any sauce left in the skillet. Melt the butter in a large skillet. (I used the same one I cooked the chicken in.) Add the garlic and saute for 2-3 minutes. Add the bacon bits and lemon zest. Stir in the cream and the cooked pasta. Add remaining lemon juice to taste. If the sauce is too thick, add a few tablespoons of the reserved pasta water. ( My kids don’t like it too lemony, so I usually just add another tablespoon of lemon juice and some of the pasta water.) Stir in the parmesan cheese and cook till melted. 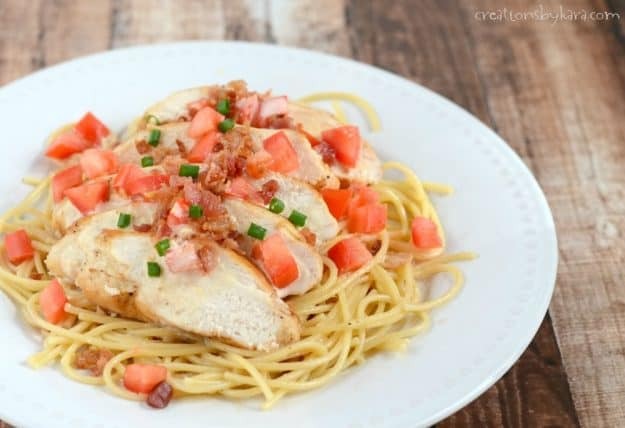 Slice up the chicken and place it on top of the pasta. Top with tomatoes, and green onions if desired. 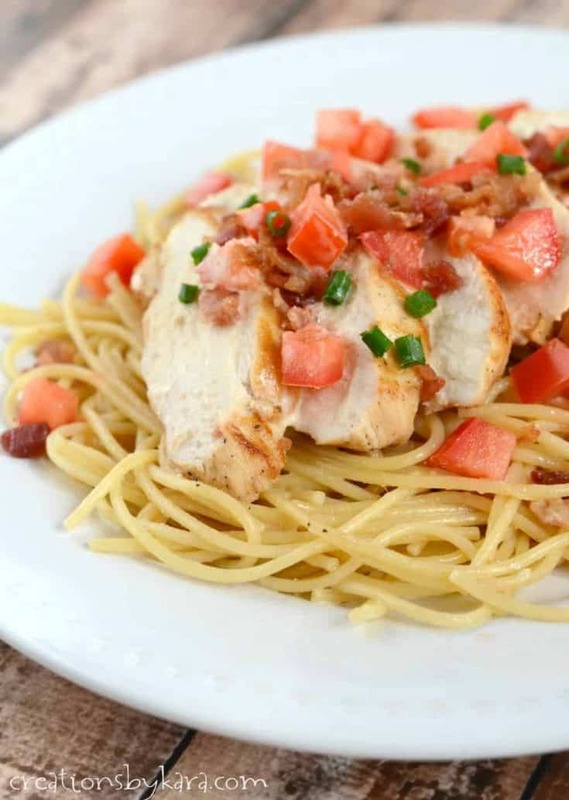 Cook your pasta in salted boiling water while you prepare the chicken. Drain, but reserve 1/4 cup of the water. Sprinkle salt, pepper, and rosemary on both sides of each chicken breast. Grill or cook in a skillet with a small amount of oil for 7-8 minutes on the first side. Zest the lemon, then juice it. Combine one tablespoon of the lemon juice with the honey. Brush over the tops of the chicken, then flip it, then brush on the remaining sauce. Cook till chicken juices run clear. Set aside chicken and any sauce left in the skillet. Melt the butter in a large skillet. (I used the same one I cooked the chicken in.) Add the garlic and saute for 2-3 minutes. Add the bacon bits and lemon zest. 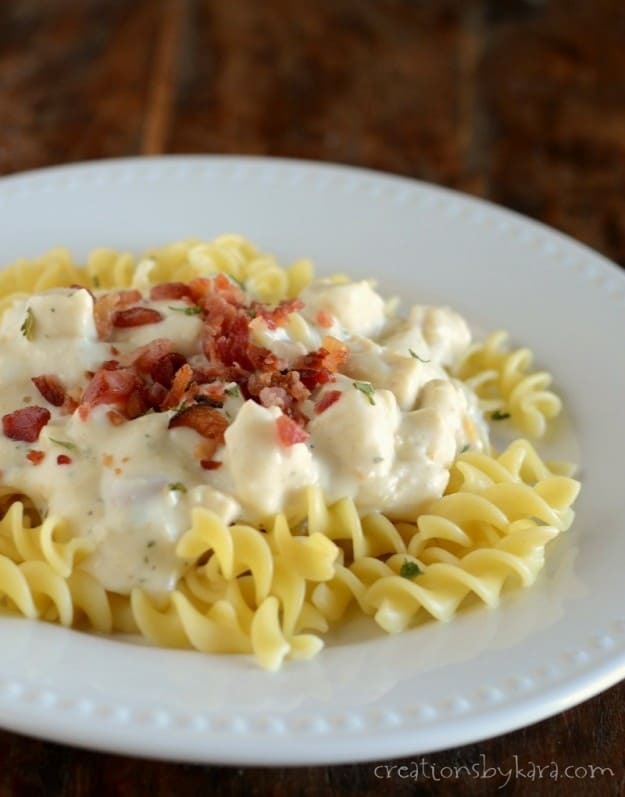 Stir in the cream and the cooked pasta. Add remaining lemon juice to taste. If the sauce is too thick, add a few tablespoons of the reserved pasta water. Stir in the parmesan cheese and cook till melted. 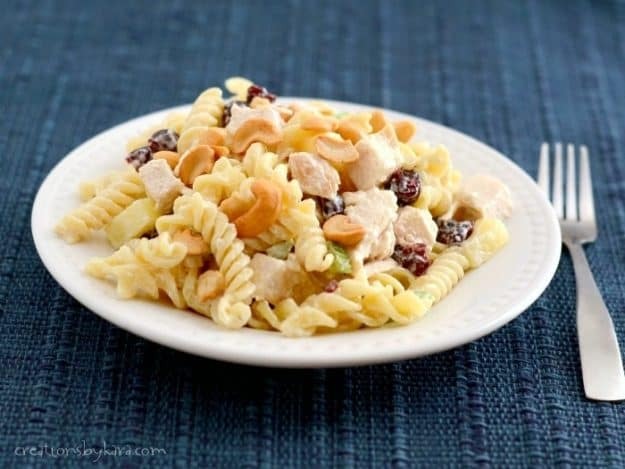 To serve, slice up the chicken and place it on top of the pasta. Top with tomatoes, and green onions if desired. I am completely lost…..how do I subscribe to your blog? Is there an easy way to print a recipe from your site? Or do I have to copy and paste into a Word document (I hate doing that)? Sorry, I still don’t have a print button. It’s in the works, but I just can’t seem to find the time to get the dang thing finished. For now you just have to copy and paste. Sorry about that! This looks great! How much cream and what kind do you mix in? Oh my gosh, I forgot to list cream in the ingredients. Ooops! It’s 1/2 cup cream. You can use either light or heavy whipping cream. Sorry about that. This looks yummy…on my way to the store and realized that you mentioned adding cream in your instructions, but it’s not in the list of ingredients. What should I get? Thanks for the recipe! No problem. We’re going to try it tonight. I’m good at improvising. Thanks again! This sounds great! I don’t blame you about not wanting to mess with the arrangement. I totally get that! Thanks for sharing. Wow…I am going to try this tonight! Yum!